« Life is Great! Life is Horrible!… OK, It’s Both! 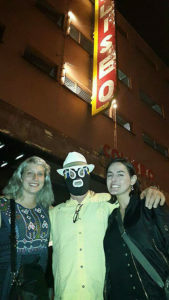 On Friday night April 21 we all piled into the Coliseo for Lucha Libre in the FMB6 format, Cara a Cara… here I am masked outside with Luciana (l) and Isa (r). I get a lot of “star” treatment, which always makes me feel rather sheepish, but I’ve learned to roll with it, and use it to open a larger conversation about how history is not made by “great men” but by large groups of people coming together. 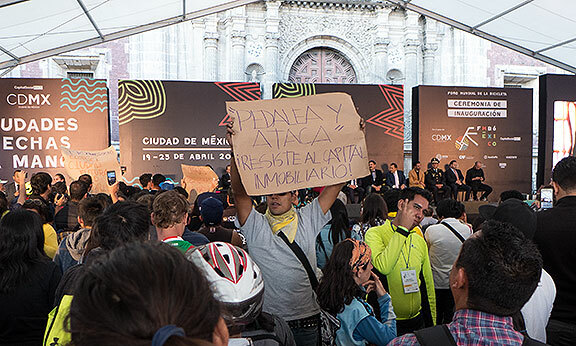 The World Bike Forum is an ongoing interesting example of this, even if it suffers its own contradictions and difficulties. 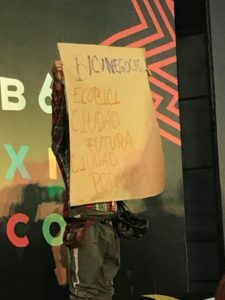 The opening night saw a minor protest erupt during the first speeches, with a few people carrying hand-scrawled signs through the crowd. 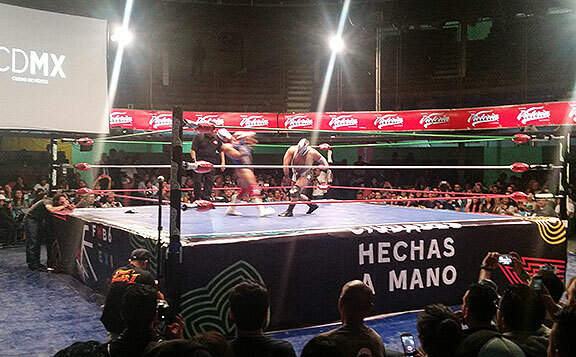 Like last year’s gathering in Santiago, Chile, this year’s in Mexico City depended on a great deal of support and resources from the local government. We held our meetings in a group of historic buildings rehabilitated for use by conferences such as this one, all within a few steps or blocks of Plaza Santa Domingo, a few blocks north of the city’s center. For the more radical cyclists in town, this cooptation by the local government was a big problem. For the organizers themselves, they felt trapped between an often unresponsive local government and the harsh critiques of those who refused to take part. Accusations of sexism were also made; knowing Mexican culture somewhat, I’m sure there were plenty of examples to justify that denunciation, but it was also true that there were dozens of women prominently involved in this whole Forum as speakers and organizers, and several panels and speeches addressed gender and sexism as it relates to bicycling and urban planning. My own contribution this year was written to highlight my main point regarding bicycling these days: it’s simply not enough to advocate for bicycling! So it’s a bit ironic that I keep coming to World Bike Forums to make this point, but I think it’s been well received, based on last year and this. Adriana helped me come up with a good title. The conference theme was the slogan “Ciudades Hechas a Mano” or “Handmade Cities.” So she gave me the punning title (in Spanish) “Ciudades que Echan la Mano,” or “Cities That Lend a Hand.” I’m posting the entire text below in English, and the previous blog entry has the Spanish version I gave. I realize now that my warning was not explicit enough about how bicycling culture disappears more or less in direct proportion to the success of a given area in getting a lot of people to adopt the bicycle as a means of transportation. 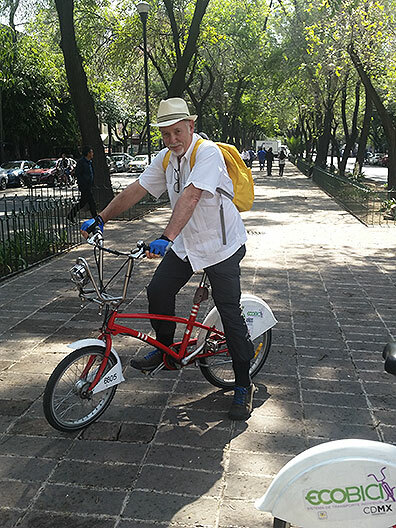 This is a difficult problem for the participants of the World Bike Forum because the raison d’etre of this event has been our shared enthusiasm for bicycling and our commitment to the beleaguered culture that sustains us, surrounded by metropolitan areas clogged with private autos. Peter Cox raised some good questions in his presentation, connecting bicycling to much larger issues of what we want. Janette Sadik-Kahn gave an inspiring presentation on her work in NYC to kick off the Forum. San Francisco’s once vibrant grassroots bike culture has pretty much vanished at this point, precisely because we have tens of thousands of daily cyclists around the city. We still have a functioning Bike Kitchen and lots of the people who were once doing Bike Rodeo, Bike Ballet, bike zines, Critical Mass, etc. etc. are still around, but few of us are excited anymore to do things merely because they are bicycle-related. 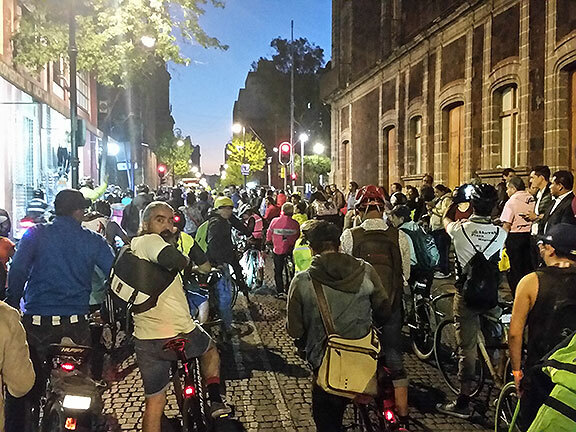 After 25 years, Critical Mass has been terribly boring for years now. There’s always the possibility of a serendipitous encounter, but hardly anyone brings any creative energy or thoughtful interventions to the monthly ride… which carries on in spite of the general collapse of interest, partly because every month people show up for whom it is still a new experience, or because they are visiting from elsewhere and wanted to do the ride at the Mecca of the experience… Monthly Bike Parties take place in the east bay and south bay and draw thousands to a firmly anti-political bike ride that is oriented around obeying laws and stopping to drink and smoke and hang out at a number of pre-set locations on a pre-designed route. It never really took hold in San Francisco, though it may still be rolling in small numbers here too. 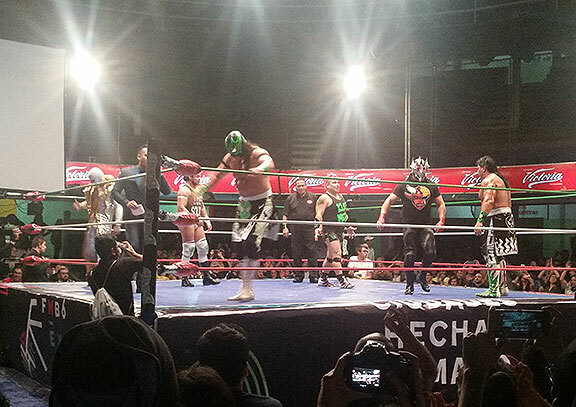 There was a “rodada” of hundreds every night of the Forum… this was opening night. Anyway, beyond the general fall-off of the culture that once sustained the bicycling “community,” the bigger point is that even if we did get a majority of the population to bicycle, that is only a small beginning on the kinds of wholesale reorganization of how we produce life that we really need to be pursuing. 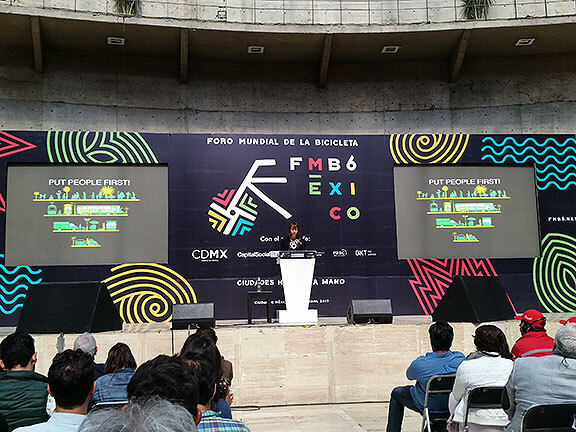 Finally my presentation at FMB6 was to promote the idea of a robust urban public commons as a prerequisite for an unprecedented level of creativity and participation in making a good life for all. 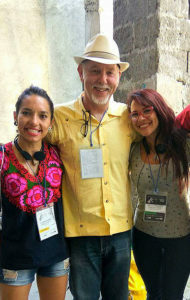 Especially in an inconceivably confusing and messy place like Mexico City, the importance of establishing rights to the basics of life–clean water and air, comfortable housing, adequate clothing, good healthy food, free transport and communciations–is at the center of a transformative politics adequate to the dire state of the world. The notion of scarcity is increasingly obsolete as clearly there is plenty of everything for everyone if we were to dedicate ourselves to making that true. I know that my 20-minute pitch for going through the “window” of bicycling to the other side, where these deeper issues are what we must confront, was insufficiently sophisticated to be truly convincing. Coincidentally a new article just appeared “From Platform to Open Cooperativism” by Stacco Trancoso and Anne Marie Ultratel. 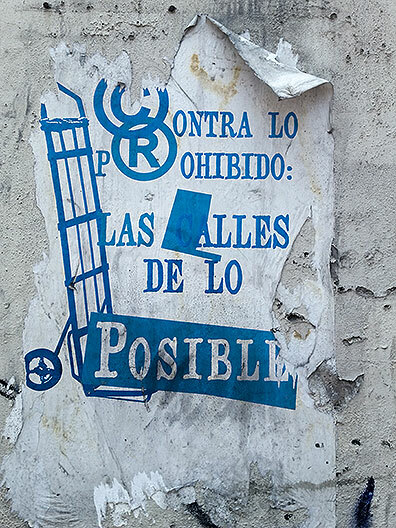 (A couple of weeks ago, Stacco helped me think about how to translate “public commons” into Spanish, as I learned from him that it has been an ongoing debate. Adriana and I ultimately decided to go with a new version: “lo público común urbano”, though I don’t really know if it “took.”) In this article they brilliantly unpack the complicated relationships between different ideas floating around of “sharing” and “commons” and “cooperativism” as they are all evolving through cooptation and reinvention while the economy itself is moving at breakneck speed into new paradigms of exploitation and precarization. 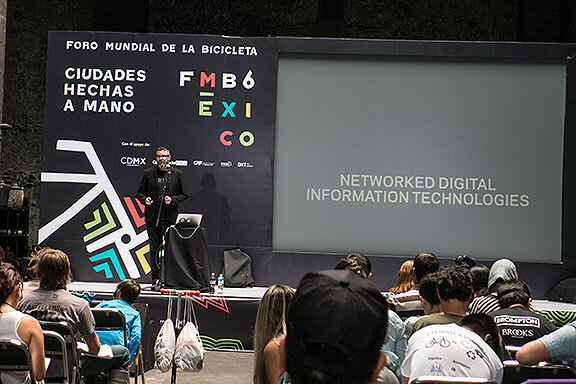 Adam Greenfield, intelligent critic of “smart cities” and more, gave a talk that to my mind, foregrounded technical solutions to complicated social problems. He kind of straddles the pro-tech boosterism that’s all too familiar (and well critiqued in the article cited above) and an Occupy-based anarchism… kind of a weird hybrid, but an important contribution to the conversation. 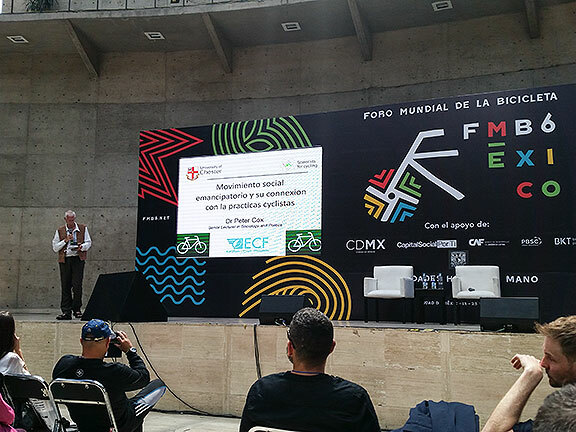 Peter Cox spoke to the title of Emancipatory Social Movements and their connection with cycling practices… also helping to broaden the discussion. 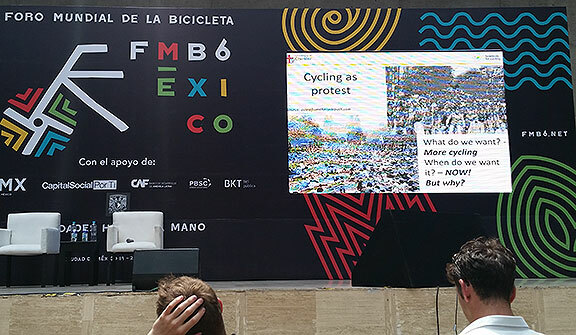 Given the many panels that took up larger issues, from issues of communications and representation to going beyond networks of collective work, to several talks on urban utopianism and citizens’ initiatives for social transformation, it seems that among grassroots cyclists, the broader issues are rising to the top. At least 75% of the panels still focus on specific discussions of public bikes, access and education, urban mobility, etc. 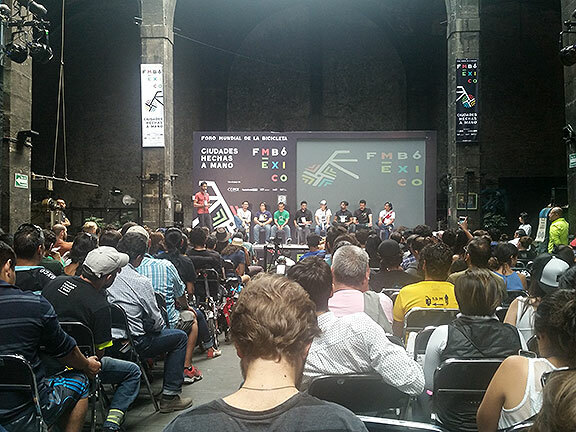 But part of what I’ve enjoyed about the evolution of the World Bike Forum is the way it has become a continental network of radicals working in the interstices of the largest cities to change how we live day to day. It is obvious to most that bicycling is a great place to start, but is hardly sufficient as an end in and of itself. I got free use of an Ecobici during my stay… finally got to use one of the ubiquitous bikeshare programs after all these years… I liked it! Gotta have your bike art! 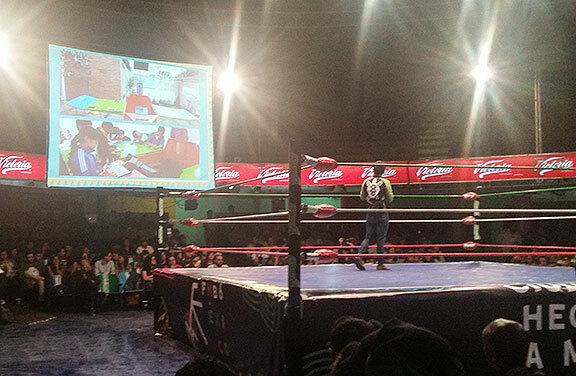 Cara a Cara pitted four short videos against each other, finally leading to the victory of “Fundacion Tortuga” from Colombia… but we got to have some “real” Lucha Libre too! 3-on-3: FMB6 vs. No Mas Bici! … bad guys lost! We often joke amongst ourselves that this event should probably be better named the Latinoamerica Bike Forum (new hashtag, #FLB for Foro Latinoamericana de Bicicleta). But as was strenuously argued during the exciting and hilarious campaign to choose the location for the 2019 forum (2018 is already set for Lima, Peru, Feb 22-26, 2018), this is already a World Bike Forum because the entire world is invited to come to Latin America and share experiences and discussions on the predicaments we all face in trying to make bicycling more possible and common. Gathering for the closing assembly, an odd experience of direct democracy where we choose from competing cities where we hold future World Bike Forums. 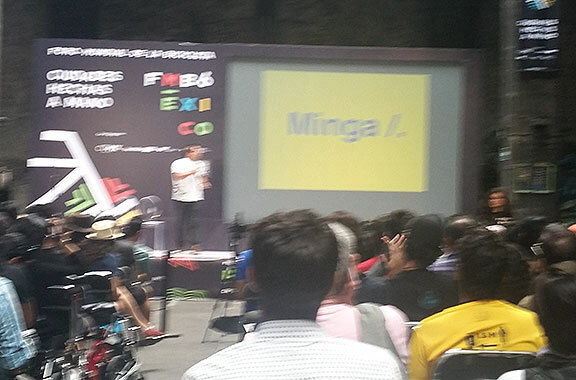 This lovely concept “Minga” means something akin to ‘barn-raising’ in English. It’s a Quechua word and helped win the vote for Quito, Ecuador in 2019. 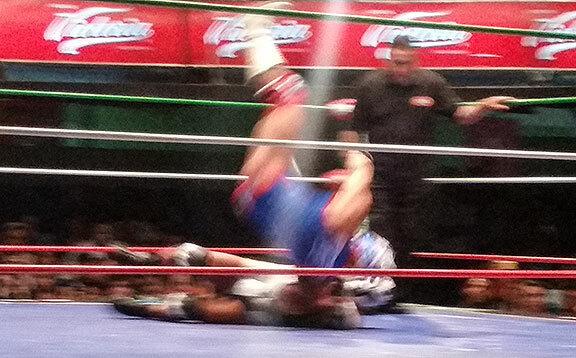 Mexico City and Mexico and I’m delighted it was held here. It was great to reconnect with so many old friends and to make many new ones. I hope I can find a good way to continue participating, even if I’m not really the bicycling superstar everyone seems to want me to be! 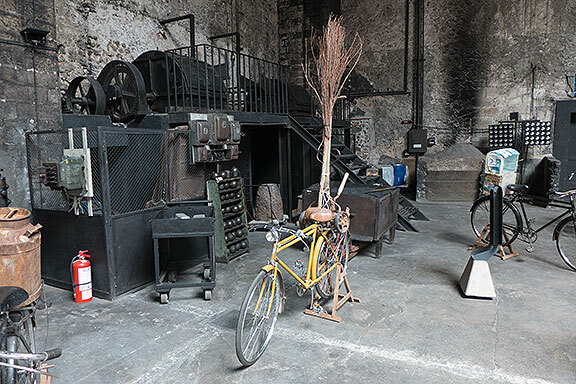 At the Museo Nusmitica, one of our main venues, the big old hall for making coins was converted into a presentation space and a museum of old bikes among the old coal bins and industrial machinery…. Great for lovers of ruins and old bikes! 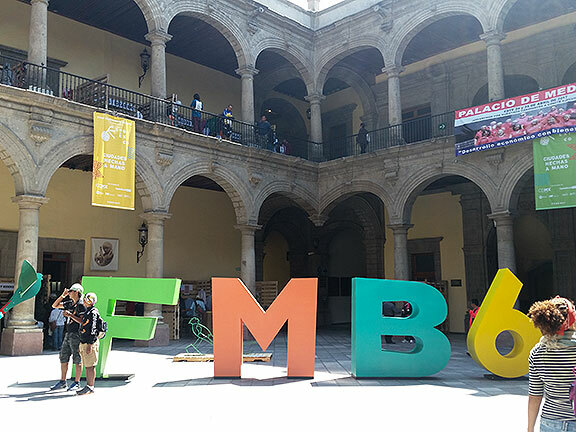 Congratulations to the organizers of FMB 6 in Mexico City. It was a great idea to make the theme “Handmade Cities” because of the beautiful way that it opens our inquiry into issues that go well beyond mere bicycling. Provoked by the conference slogan “handmade cities” I could only think about how much I’d like to have cities that lend a hand. If we really want to live in a world that honors the “handmade,” the artisanal—the work that takes time and attention and love—we need our cities to do a much better job of ensuring comfort and survival for all. There is an agenda trying to be born, still gestating within the bicycling movement, as well as in sister efforts to fight poverty, protect immigrants, halt police and drug violence, defend the rights of LGBTQ and people of color, protect an uncommercialized internet, and expand the spaces of human freedom. There is a lot of work to do to bring this world to life, but a common goal has to be to create environments that allow all of us to live without money, with less work, with less pressure and stress, and more time for the things we choose to do. Creating a well-designed, inexpensive and easy to maintainurban infrastructure isan essential contribution to making this possible. In other words, shouldn’t our movement that begins with bicycling point towards a much larger prize, namely, a radically expanded urban public commons? By urban public commons I am invoking the historic commons when land, air, water, and the basic goods of life were outside of private ownership and available to all. In a new urban public commons, we would have healthy clean water freely available for everyone. We would haveabundant street trees laden with fruit that is free to harvest for neighborhood residents.We would have a system of high-speed telecommunications available to everyone, free of cost. And of course, we would have free, efficient public transportation to complement our embrace of bicycling and walking. Our desire to live in a world that supports “handmade” goods and “handmade” neighborhoods requires a robust urban public commons from which we can all be assured our basic needs are met. Human rights to high quality water, food, clothing, shelter, communications, and transportation are the foundation on which a society of thus far untapped creativity can emerge. teaching each other how to repair and maintain bicycles. The long hours many of us have spent on these activities all represent an extraordinary commitment of intense personal labor. The work we’ve done has stamped a “handmade” DIY label on much of the bike culture, even if the bicycle is an industrial machine. 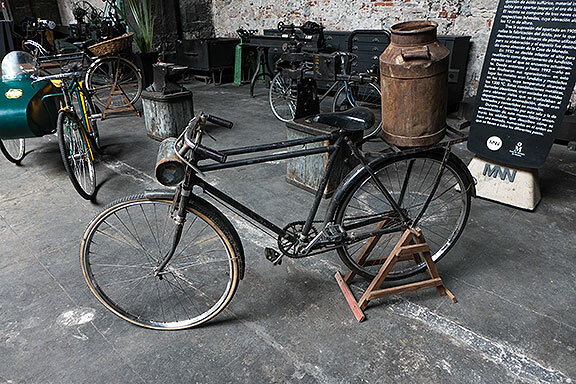 Because, after all, the bicycle is not a handmade object, but rather a product of complex industrial society. The bicycle does not exist without oil, steel, and rubber, in other words, late capitalist mass production. The urban streets we mostly traverse on our bicycles are also part of the sprawling city that itself exists thanks to complex systems of production requiring a staggering flow of resources, human labor, and institutional support. Our streets are also products of a centuries-long history of contestation and competition shaped by an evolving dialectic between public and private interests. We’ve come to FMB6 to put forward the public interest in favor of a broad embrace of bicycling. This 21st century public interest demands that we redesign all the streets of every city in the world to make dedicated space available to bicycles. In some places this has been fully embraced and in many others a tentative and partial beginning is underway. 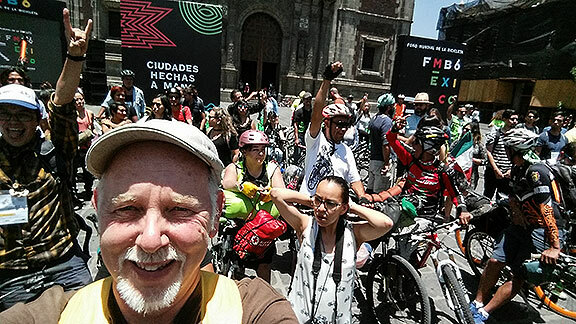 Mexico City, for example, has a long way to go, but is ahead of many other places in creating dedicated street space for bicycling as an everyday transportation choice. Bicycling is our starting point, the window we open onto a new world. But if we stand in front of the window and merely gaze, admiring the nice wooden frame, the paint job, the light glinting off the pane of glass, we abdicate our responsibility and lose a great opportunity. We must go through the window to realize that on the other side,the changes we hope bicycling embodies involve much more than just transportation. When we critically observe heavy bicycling cities such as Copenhagen, Amsterdam, and Berlin, we can see that there is a lot more to change than merely how we move ourselves from Point A to Point B. The question that is avoided everywhere is what are we DOING at Point A and Point B? WHY are we going from place to place? Does our work at a job or even at home help make the city—and the life—we want? Or is it a mere means to acquire money to buy things that only partially and badly fulfill our needs? Having opened the window and partially passed through it, we now know that our task is much greater than merely convincing others to bicycle. The shape and role of cities themselves is at stake, and the very idea of democracy demands reinvention. We make cities together, each and every one of us, even if cities seem like living beings beyond our control. Cities are complex projects that require sophisticated and complicated mechanisms to manage. The challenge before us is to invent truly democratic systems that will allow our best skills and most creative talents to contribute to everyone’s well-being. We are challenged to go beyond political parties and the corrupt liberal democracies that leave the economy as a separate, undemocratic sphere of life. We need directly democratic associations that can self-govern how we design and produce our lives. Bicyclists have shown a capacity forspontaneous self-governance during mass bike rides like Critical Mass, and more deliberate democratic engagementin advocacy efforts to challenge the transportation priorities of urban governments. We’ve learned a lot during the past decades of bicycle advocacy about direct democratic organization. Women, LGBTQ folks, youth, differently enabled and poor comrades have been central to the reinvention of our better democratic practices by demanding broader inclusion and solidarity.Can we take our skills and knowledge and apply them to a greater goal of reinventing and radically expanding the urban public commons? 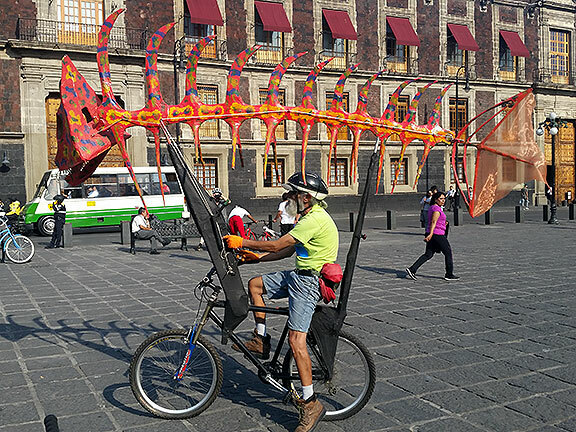 Bicyclists across the Americas have shown a remarkable capacity for creative invention, and creative reappropriation. By embracing an agenda that goes well beyond mere bicycling, the energy and solidarity and social enjoyment of our movement can supersede the easy fetishism that fixates on objects. Sure we’d like many more people to bicycle, but we really need a thorough-going social revolution which animates everyone to a level of participation, responsibility, and creativity that we have never seen before. Life could be so great! Not just because we will bicycle, but because we will have changed how we live. Not only can we choose to move through cities differently, we can choose to make our cities themselves very different, not just playgrounds for the rich and garbage dumps for industrial waste. There is enough of everything for everyone—scarcity is a myth! Our political efforts and social organizations should declare loudly that material scarcity is a mechanism created to maintain social control and class oppression. Redesigning and reorganizing cities are the key to establishing a good life for everyone. Cities that lend a hand are cities that make life better, easier, and richer for everyone. Cities that lend a hand are cities that help us to fully develop our creative and social potential, that welcome reinvention and experimentation. Cities that lend a hand are cities that guarantee a decent life for every inhabitant including clean water, clean air, quality housing, efficient and free public transportation along with an extensive grid of dedicated bikeways and pedestrian-only zones, wildlife corridors and parks where nonhuman life can flourish, free and easy access communications, and a healthy diet of locally produced food. The scale of urban life is intimidating, but we’ve been changing cities for years already. Accepting that the scale of changes we need far exceed our small face-to-face networks leaves us with the challenge of inventing new forms of democracy commensurate with the tasks of wresting control of social wealth and establishing a shared urban public commons.The profiteers and exploiters, and the corrupt politicians who serve their interests, will fight us at every step. But like water flowing through the point of least resistance, bicycling is already the easy choice in daily life that opens the window to make deeper changes. We bicycling revolutionaries are good at overcoming resistance. We have already changed the world a little bit. How much more can we do? 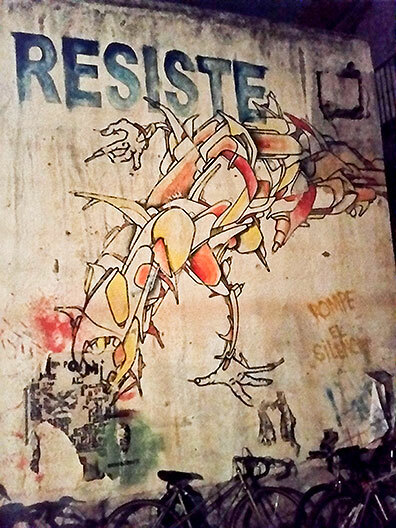 This was on the wall at the Centro del Pueblo, also home to Bicitekas…. The streets of the possible!